Applets Application clients Java Web Start-enabled clients, by Java Web Start technology. Wireless clients, based on MIDP technology. 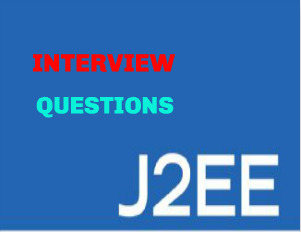 What is a J2EE module? A J2EE module has one or more J2EE components of the same container type along with one deployment descriptor of that type. An applet is a J2EE component that run on the client. In other words An applet is a program written in the Java language that can be included in an HTML page,like an image. What is a Java application Client? Java servlet is a J2EE component that run on the Server. In other words A Java servlet runs in a Web server or application server and provides server-side processing like accessing a database and/or e-commerce transactions etc. What is a JavaServer Pages (JSP)? A JavaServer Pages (JSP) is a J2EE component that run on the Server. In other words Java Server Page (JSP) is a technology for providing the content or appearance of Web pages by using servlets, small programs etc specified in the Web pages. Enterprise JavaBeans(EJB) is the J2EE component that defines a component architecture for multi-tier client/server systems. (EJB) components (enterprise beans) are business components that run on the server. save() – This method in hibernate is used to stores an object into the database. It insert an entry if the record doesn’t exist, otherwise not. saveorupdate () -This method in the hibernate is used for updating the object using identifier. If the identifier is missing this method calls save(). If the identifier exists, it will call update method. What is "application configuration resource file" ? An XML file used to configure resources for a JavaServer Faces application, to define navigation rules for the application, and to register converters, validators, listeners, renderers, and components with the application. The process of saving the state of an object and restoring it. A Java-based build tool that can be extended using Java classes. The configuration files are XML-based, calling out a target tree where various tasks get executed. What is authorization constraint ? An authorization rule that determines who is permitted to access a Web resource collection. .jar files: These files are with the .jar extenstion. The .jar files contains the libraries, resources and accessories files like property files. . In action mapping we specify action class for particular url ie path and diffrent target view ie forwards on to which request response will be forwarded.The ActionMapping represents the information that the ActionServlet knows about the mapping of a particular request to an instance of a particular Action class.The mapping is passed to the execute() method of theAction class, enabling access to this information directly. What is bean-managed persistence ? The mechanism whereby data transfer between an entity bean's variables and a resource manager is managed by the entity bean. What is binding (XML) ? What is build file ? The XML file that contains one or more asant targets. A target is a set of tasks you want to be executed. When starting asant, you can select which targets you want to have executed. When no target is given, the project's default target is executed. What is certificate authority ? A trusted organization that issues public key certificates and provides identification to the bearer. What is client-certificate authentication ? An authentication mechanism that uses HTTP over SSL, in which the server and, optionally, the client authenticate each other with a public key certificate that conforms to a standard that is defined by X.509 Public Key Infrastructure. In an XML document, text that is ignored unless the parser is specifically told to recognize it.